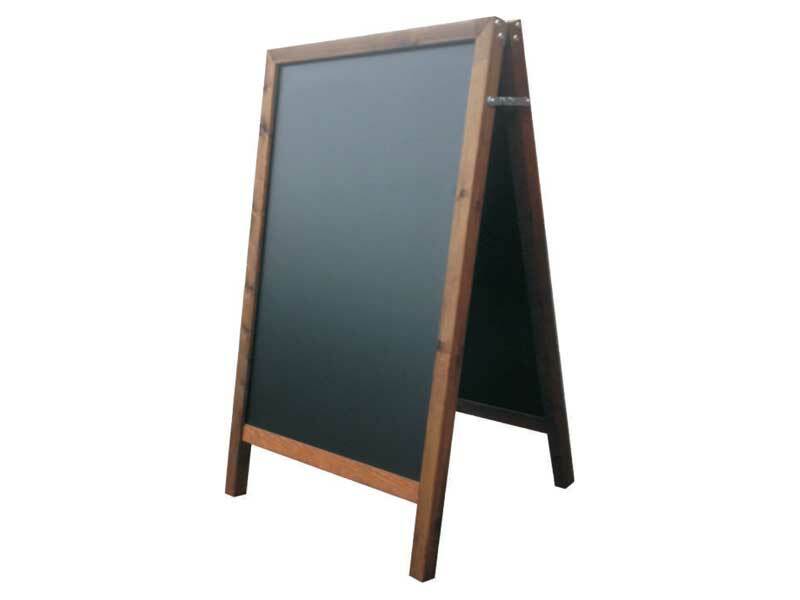 What could be better than a straight-topped chalkboard designed for the outdoors? This sturdy Outdoor A-Board will share your message with everyone. Set this chalkboard outside your business, office, shop, or facility. Be sure to check with the local zoning regulations before you do. Once you get their okay, you are ready to use this Outdoor A-Board in front of your car repair shop, restaurant, office building, school, church, museum, café, shop, store, or anywhere you want to talk to people about what you do. If you want to increase sales, bring more people into your establishment, advertise your products, list your business hours, direct foot traffic, or tout your sales, this is the chalkboard for you. This Outdoor A-Board sidewalk sign makes showcasing your special written messages to the public easy. You can nab potential customers or attendees attention by placing this Outdoor A-Board in front of your store, business, or other establishment. Bookstores use them to promote sales, advertise new book offerings, advise the public about book signings, and invite people to browse the many fine titles they carry. Pet shops use them to promote sales of pet food, pet services, and pets. Grocers set them outside to tout the specials of the day. Dress shops offer sales and clearances on them. The Outdoor A-Board is a sturdy moisture-resistant outdoor sign; it has the potential for attracting new customers as well as welcoming current customers. 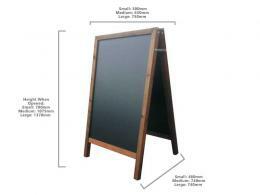 This A-frame chalkboard has an American Redwood frame with Melamine panels. Quality-made in the United Kingdom; it is moisture resistant. 750 mm by 1400 mm, weighing 15 kg, with a visible board size of 670 mm by 1170 mm. You can choose from Oak, Pine, Dark Oak, Black or Mahogany colour for the wood frame. 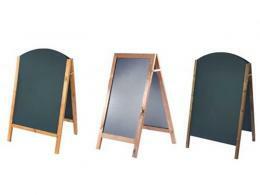 This A-frame chalkboard welcomes your artistry with both chalk and chalk pens. It has a fixed 6mm exterior grade. 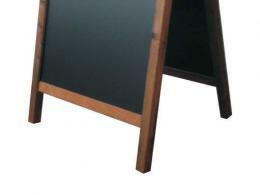 Made in the United Kingdom, this chalkboard is a good choice for outdoor advertising. The slate for writing was in use in schools in India as early as the 11th century.